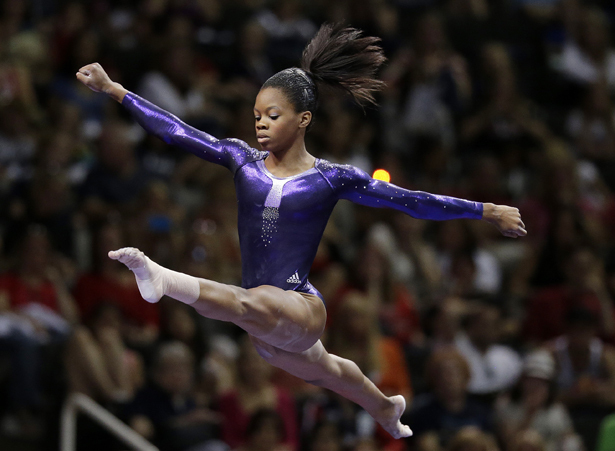 In gold medal–winning gymnast Gabby Douglas, we see the true power of political representation in sports. There are two kinds of political athletes. The first, and most memorable, are athletes who engage in the explicit politics of protest. This tradition is marked by Muhammad Ali saying, “I ain’t got no quarrel with them Vietcong.” It’s Billie Jean King marching for Title IX. It’s Curt Flood saying he refused to be a “well paid slave.” It’s John Carlos and Tommie Smith raising their fists in the name of civil and human rights. But then there is a different kind of athletic politics: the politics of representation. That’s Jackie Robinson the moment he took the field to break baseball’s color line. That’s Martina Navratilova, all ropey muscles, forcing the world to confront a more powerful kind of woman athlete. That’s Compton’s Serena and Venus Williams dominating their country club sport. Whether or not these athletes embraced the burden, they carried the aspirations and expectations of countless others. We can now add Gabby Douglas to their ranks. The 16-year-old from Virginia Beach is now the first African-American woman as well as the first person of color to win gold in the gymnastics individual all-around competition. She is also the first US gymnast in history to win both individual and team gold at the same Olympics. Douglas’s journey is as unique as her triumph: one marked by having to navigate the racial segregation that defines so much of the United States. At 14, Douglas left her mother, three siblings and working-class Virginia Beach community to move to West Des Moines, Iowa, so she could train with renowned Chinese coach Liang Chow. In Iowa, Douglas lived with a host family of strangers in a nearly all-white community and thought she might be the only black person in the state. In the very white world of gymnastics, Douglas also stood out. At most meets she would be the only person of color performing. Douglas was home-schooled in Des Moines by her host family, adding to this sense of isolation. Homesickness meant crying herself to sleep and calling her mother in Virginia Beach, floating the idea of coming home. But Douglas was indomitable and developed a reputation for the ability to actually seem like she was flying on the uneven bars, earning the rather unfortunate nickname “The Flying Squirrel.” She also had a reputation as someone with potential, but a cut beneath the best gymnasts in the world. Marta Karolyi, the grim US national team coordinator who bestowed the “Flying Squirrel” nickname on Douglas, saw her as “an average good gymnast.” Douglas, however, wouldn’t be discouraged. Her sense of comfort and confidence is visible in her smile, which is as striking as one of her dismounts. Anyone watching women’s gymnastics sees that many of the contestants look like hostages to screaming parents, rage-aholic coaches and their own unhappiness. Gabby Douglas actually looks happy to be there and through force of personality is congenitally unable to be invisible. This also has political repercussions, powerful enough that the largely sheltered 16-year-old seems to sense what she could mean. As she said to the New York Times in June, “I have an advantage because I’m the underdog and I’m black and no one thinks I’d ever win. Well, I’m going to inspire so many people. Everybody will be talking about, how did she come up so fast? But I’m ready to shine.” Shine she did.